Oxford is steeped in literary history, being the birth place to imaginative places such as Narnia and Middle Earth, and having links to more contemporary reads such as Harry Potter and His Dark Materials too. The big book geek that I am, I of course made it my mission to see as many places in the city of dreaming spires related to literature, from Tolkien's Oxford home right down to what could've been the inspiration for Mr Tumnus to C.S. Lewis. And from the shop where the real Alice from Lewis Carroll's famous Wonderland books bought her sweets, to an impressive dining hall that looks to come straight out of Hogwarts. In fact, much of the gorgeous architecture and surroundings in Oxford look quite fantastical and it's no surprise it was the inspiration for so many imaginative worlds. J.R.R. 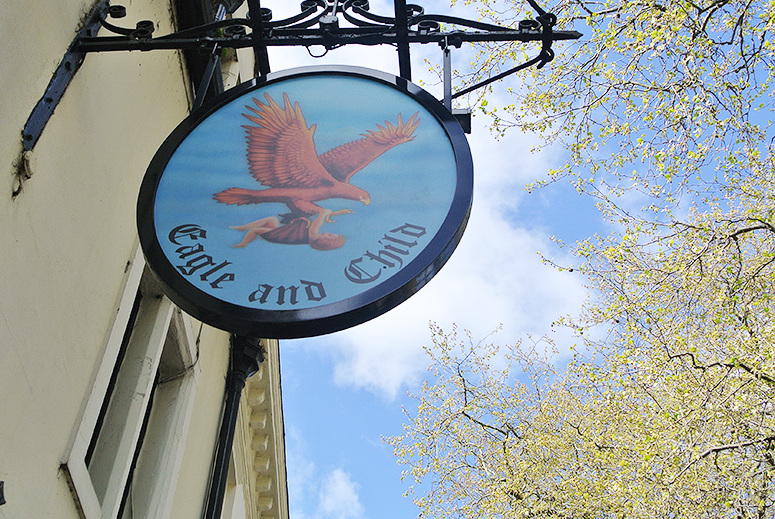 Tolkien (The Lord of the Rings) and C.S Lewis (The Chronicles of Narnia) were both part of The Inklings Literary Group, and from 1933 until the early 1960s this pub (known as The Bird and the Baby to locals) was a place the group met up. There is a handwritten note above the fireplace of which I unfortunately don't have a picture (it's in a nook on the right hand side when you walk in but it was busy when I was there). And there are some other nods to these literary greats throughout as well. This is the only literary connection not in the city centre, instead this is about a 20 minute walk from the above pub (pretty much a straight line, so easy to find). 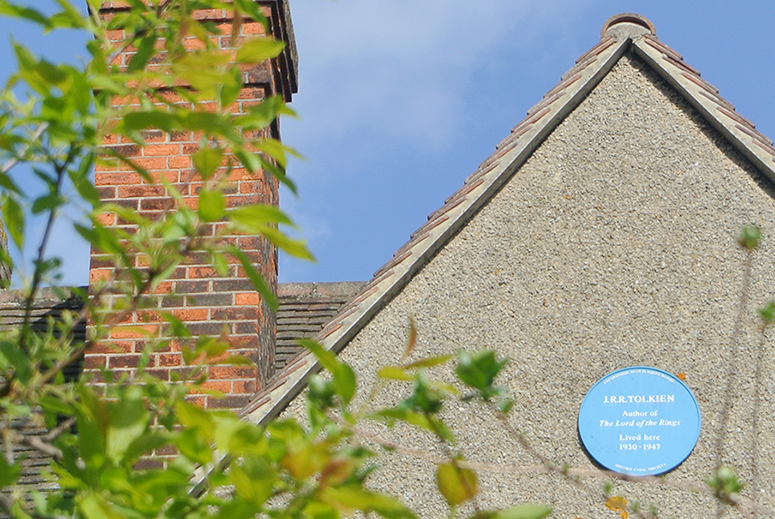 It's a private residency and so you can't go in, but there is a blue plaque on the house to mark that Tolkien used to live there from 1930 to 1947 (he also lived at number 20 next door from 1926 until 1930). The walk to the house is lovely on a sunny day, passing alongside plenty of gorgeous houses and even an all girl's boarding school that looks to come straight from an Enid Blyton book. Tolkien's home is the only location in the post a little further out, the rest is all snug together in the city centre and easily walkable from one another. If you're on a Tolkien roll anyway I recommend popping by Pembroke College. He was a fellow there from 1924 until 1945 and this is when he wrote The Hobbit and the first two The Lord of the Rings books, so history was made here! 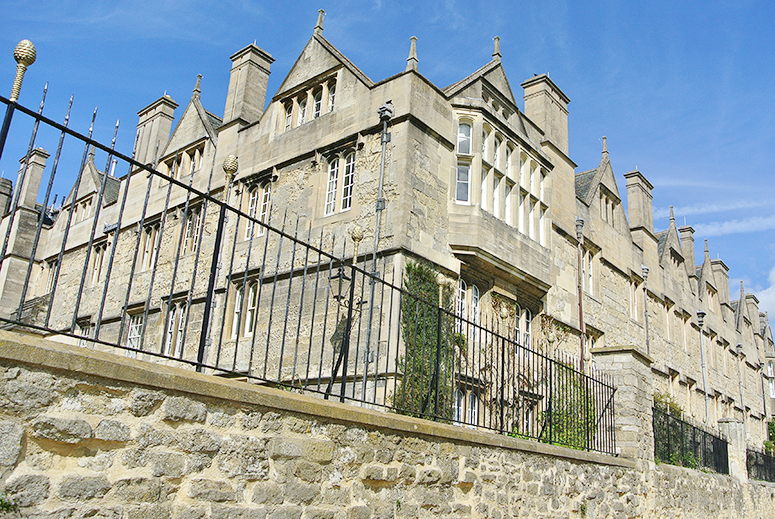 Another college to check out (and the final stop on what has turned into an unofficial Tolkien tour) is Merton College, which is where he was a Professor of English Language and Literature from 1945 until 1959. Right behind the College is the University of Oxford Botanic Garden, which until recently housed a tree known as Tolkien's tree, and may have been the inspiration for the party tree in the Shire in Hobbiton. 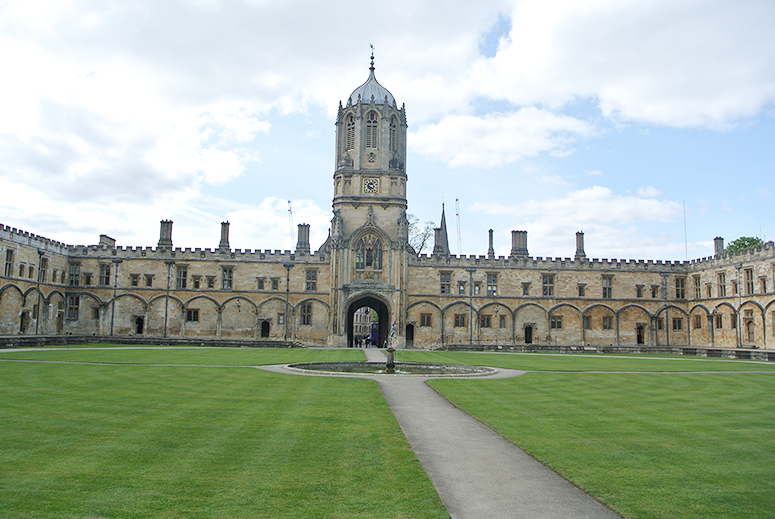 Right across the road from Merton College is Christ Church, a remarkable building in its own right. Though in recent years it's mostly become known for its grand dining hall, which was the inspiration of the dining hall in Hogwarts, the wizarding school of wizardry in the film adaptations of J.K. Rowling's Harry Potter series. A replica was built in London, though the cast and crew did film in other locations in Oxford. Charles Dodgson (aka Lewis Carroll) was also a Mathematical Lecturer from 1855 until 1881 at this college and during this time he wrote Alice's Adventures in Wonderland, inspired by Alice Liddell, the daughter of the then Dean of Christ Church. 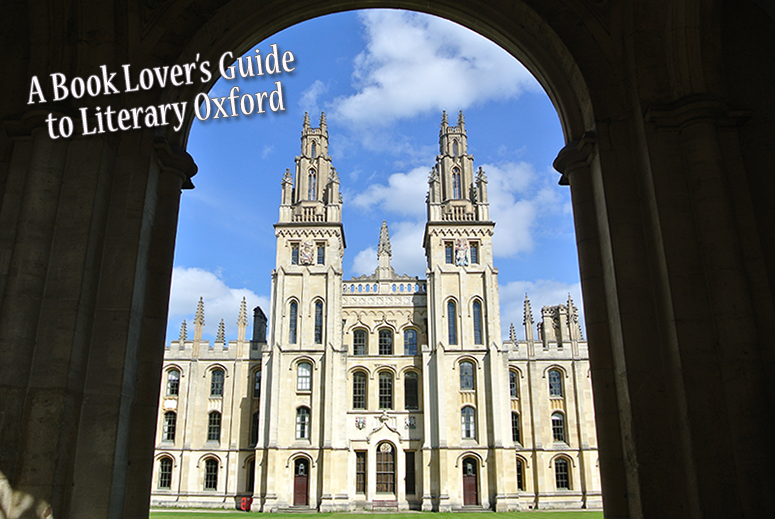 The final college that must get a mention in this literary guide is Exeter College. 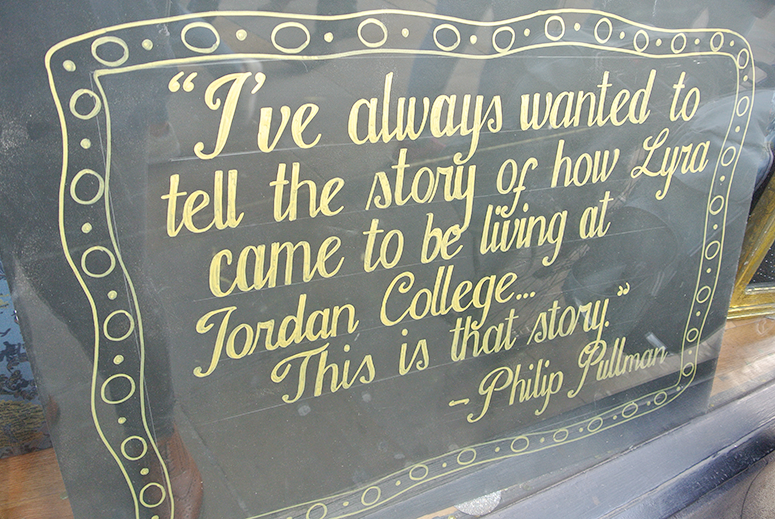 This is where Phillip Pullman (Northern Lights) studied from 1963 until 1968 and it was the inspiration for Jordan College in His Dark Materials. The 2007 film adaptation of the first book also used this College for a filming location. 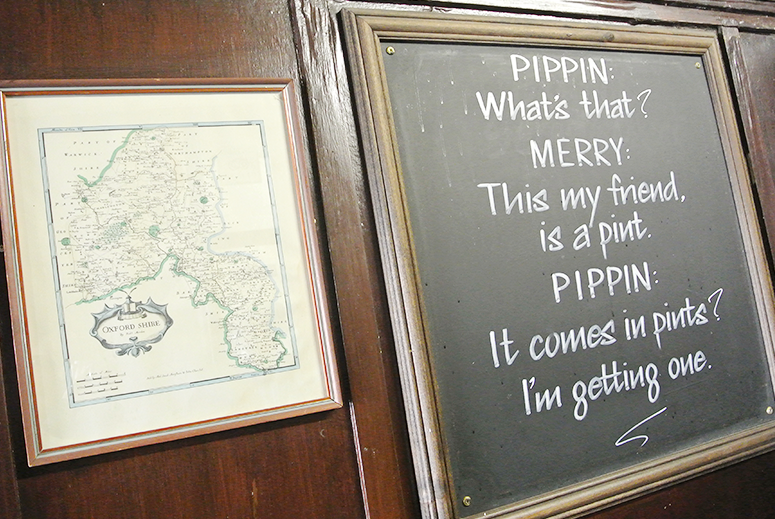 Lyra's Oxford may exist parallel to our own, but there are still plenty of little nods back to the Oxford we can wander around in today. And with the series so rooted in this city, it's no surprise that on my visit all bookshops were advertising Pullman's upcoming Book of Dust trilogy (a companion to the original books), even though the first instalment is not out until October! 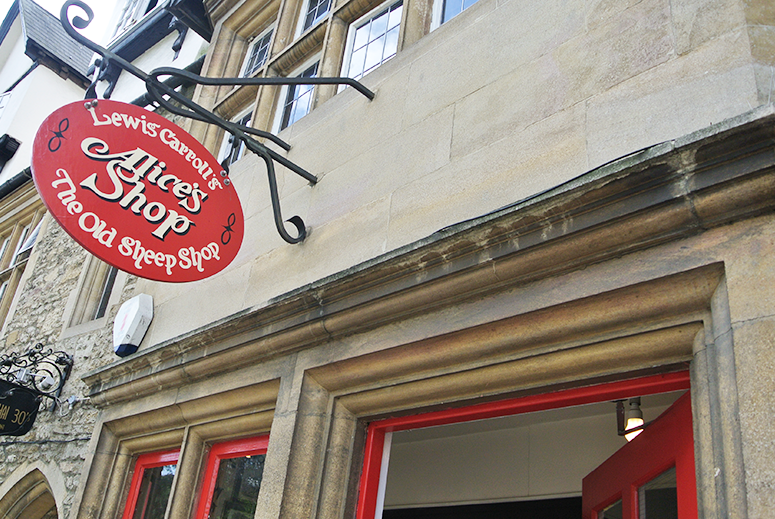 Across the road from Christ Church is, perhaps not unsurprisingly, Alice's Shop. This place is a mecca for any fans of Alice in Wonderland as it's filled to the brim with souvenirs featuring the famous characters from Wonderland, both from the Disney adaptation and the original book illustrations. From the Mad Hatter to the White Rabbit and the March Hare to the Queen of Hearts; you can find them printed and created on anything you can possibly imagine. 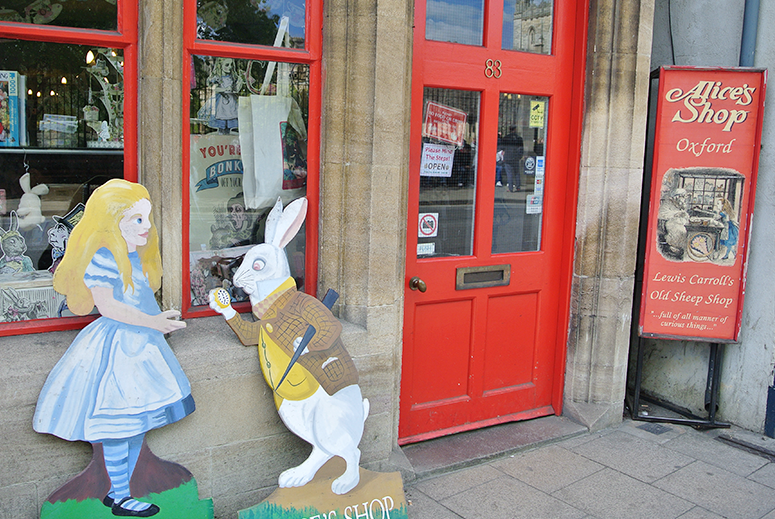 The shop's claim to fame is that the real Alice, supposedly, bought her sweets here as a child. 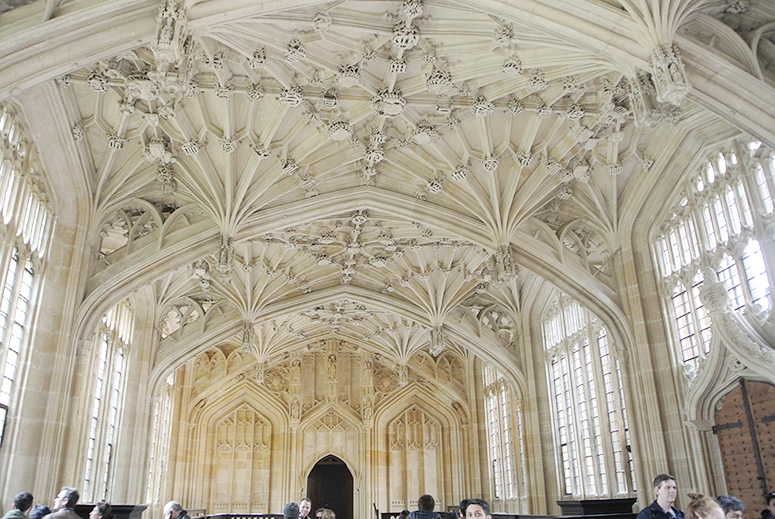 One location in Oxford used for the filming of the Harry Potter series is the grand Bodleian Libraries. Not only did it serve as the Hogwarts library, but also as the infirmary. The part used for the infirmary is freely accessible, but the library bit only as part of a 30-minute guided tour. Alternatively you can watch a video of it here. This is not a location that has inspired a new world, perhaps, but it is one of interest to book lovers. 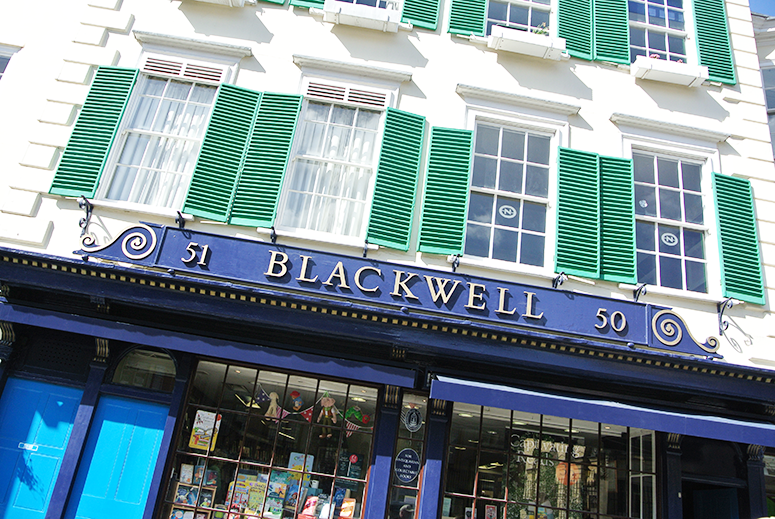 This is the place where the famous British booksellers started back in 1879 (so when Lewis Carroll was around). There are multiple shops right next to each other (including one dedicated to posters and another to music) and The Norrington Room is is the largest room devoted to selling books in Europe. How cool is that?! 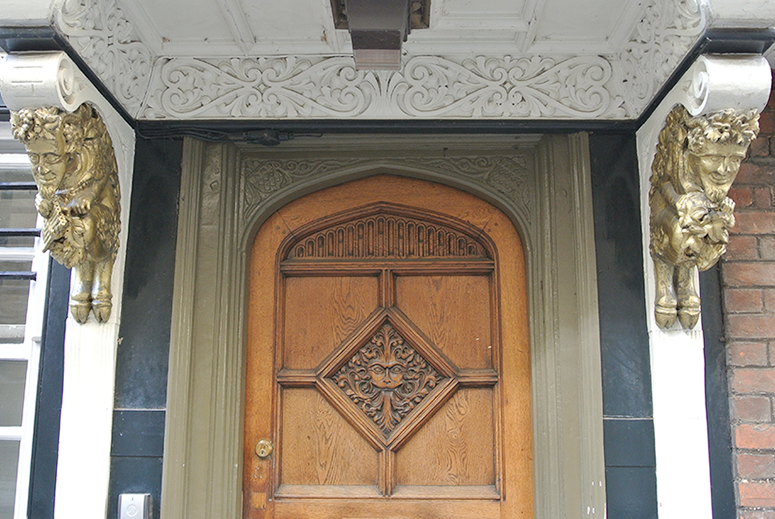 Now, I read online that there is a door with a lion carving here that could have been the inspiration for C.S. Lewis' Aslan in The Chronicles of Narnia, but despite circling the building several times I couldn't find it. Unless it's the one in the picture below? I don't see it... I did, however, come across a cute decorative carving that looks an awful lot like Mr Tumnus from the same book series. What do you guys think? 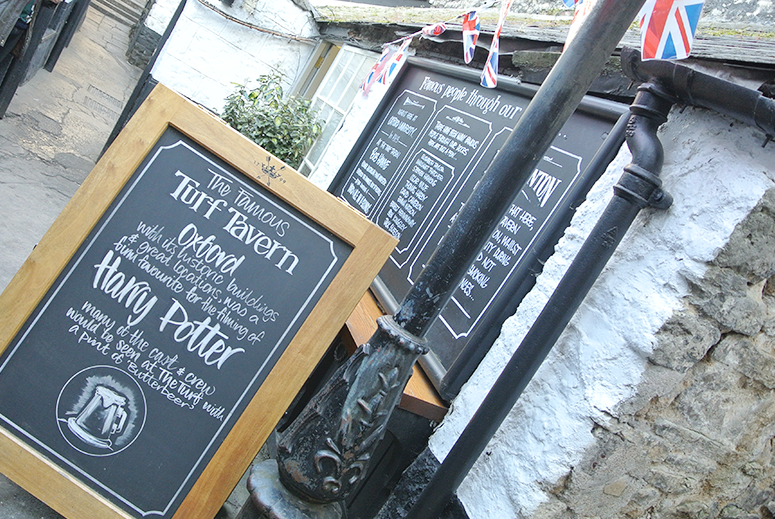 This one might be a tad far-fetched but it's a cute location and a great place to rest tired feet and refuel with food and drink, so I'll include it. 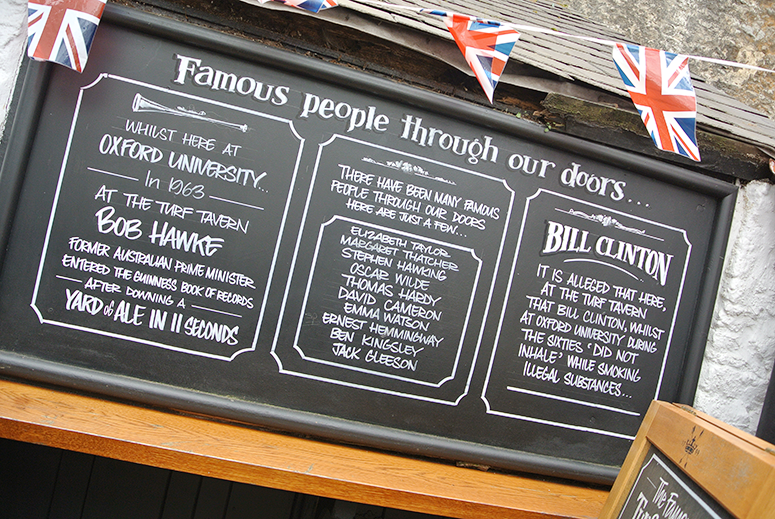 Tons of famous faces have passed through the doors of this famous tavern, including Bill Clinton, Stephen Hawking and Elizabeth Taylor. Literary connections include C.S. Lewis, the cast and crew of Harry Potter, Oscar Wilde and Ernest Hemmingway. And that's it for all the literary hot spots in Oxford I managed to visit in a single day there. 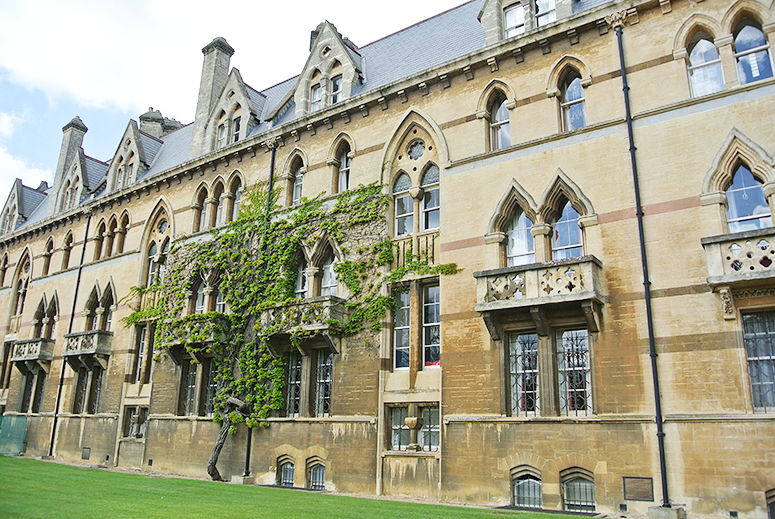 Most of these places are publicly accessible and many are free, so when you visit Oxford make sure to add a few (or all) to your own itinerary. If there are any bookish locations missing, please do leave them in the comments below so I can seek them out on a next visit! Loved this post? Check out A Book Lover's Guide to Literary Paris too! What a lovely post, SO much literary history in Oxford! You are better than any travel agent for making me want to go! Love wandering around Oxford - thank you for grouping all the literary links together for my next trip there. We're connected on Instagram, so why not connect here as well? I loved this post, all o my favorite books are in there! ;) Didn't know that there is upcoming Pullman's trilogy, so looking forward to that. And regarding the lion, isn't it the one in the middle of the door pictured? Trying the Gousto Food Box – Is It Worth It?